This project is a chance for students to research into the geography and history of Bristol and some of it’s Parks and Green Spaces, and then formulate walking trails that would be both interesting and informative to members of the public. These could start, end or pass through parks and green spaces or be self-contained in one. Tasks include: cultural or historical research of a particular area of the city and then writing the copy which would appear on leaflets, maps, or online. Upon completion of the research, students could then collaborate with Creative Industries students working to create the print and digital materials to promote these new walks to the public. Suited for: This position is suitable for students in the fields of History, Journalism, Geography, Social Sciences, or English, and is an excellent live project to add to your CV if you are considering a career in teaching, events, or museum work in the future. 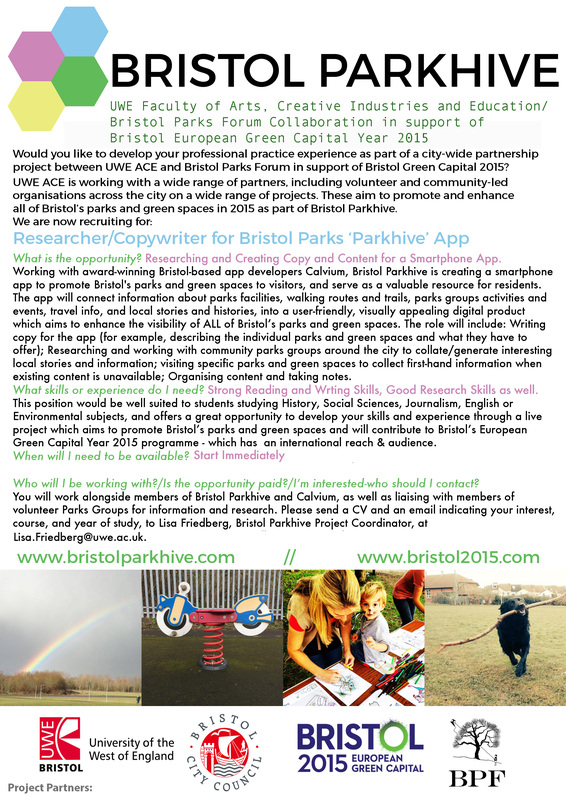 Please send an email indicating your interest, course, and year of study to Lisa Friedberg, Bristol Parkhive Project Coordinator, at Lisa.Friedberg@uwe.ac.uk.